A cruise on ‘Clair’ unfolds around you with a million soothing landscapes, sumptuous food, delicious wines and pleasant daily adventures while you gently float along this magnificent tree-lined canal. Your day usually consists of a daily excursion, often in the morning, followed by lunch onboard then barging during the afternoon. Clair de Lune’ has its favorite excursions that work well with the barging schedule and that provide the guest with a well-rounded variety of sight-seeing and activities. These excursions highlight the hidden “jewels” of historical or natural interest along with colorful open-air markets, wine-tasting, shopping, or cultural fairs and festivals. Since every group has different interests ‘Clair de Lune’ specializes in tailoring excursions to meet the requests of any particular guest or group. Our crew can draw upon their lengthy local experience and precious contacts to fulfill your special requests. 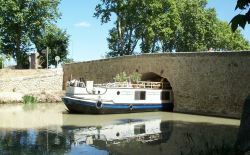 You are met at the designated meeting point and transferred to Claire de Lune moored at the port of Carcassonne. A champagne welcome on board as the Captain introduces you to the crew. Time for a walk or bicycle ride before your first dinner on board. After breakfast, we cruise to Villedubert and moor at the edge of the lock. Transfer after lunch to the largest and most beautiful walled city of Europe, Carcassonne. Dating back to the Gallo-Roman era, this is the most complete medieval fortified city in existence today with its 52 watchtowers, portcullis and extraordinary repertoire of defences, which resisted the many armies that tried to storm this glorious Camelot setting. Dinner on board. We cruise today through four locks to Puicheric. Lots of opportunity to cycle or walk or just sit in the spa pool and watch the world go by. After lunch we transfer to the village of Lagrasse, with its Benedictine Abbey and narrow streets. We enjoy a wine tasting at Chateau Villemagne. Tonight, dinner ashore at a local auberge. This morning we cruise to Le Somail through stunning countryside. After lunch we transfer to the beautiful city of Minerve, the ancient capital of the Minervois, which boasts a 12th century Cathar fort surrounded by deep limestone gorges. Besieged by Simon de Montfort in 1215, its hilltop location affords spectacular views. A fascinating recreation in miniature of the bloodthirsty Cathar rebellion and small museum complete this intriguing picture. Return to the barge for the Captains Farewell Dinner on board. After breakfast, depart the barge by minibus and transfer to the designated drop off point.